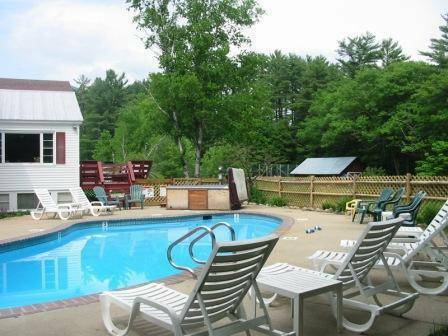 Cranmore Mountain Lodge, family friendly B&B, with year round outdoor hot tub, seasonal pool, pond stocked with trout and many more amenities. Off the main road, yet minutes from restaurants and attractions. 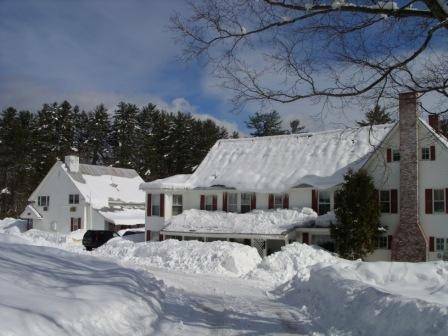 We are ideally located at the heart of all the attractions the Mt Washington Valley has to offer, and minutes from burstling North Conway Village with many restaurants and tax-free outlet stores, as well as minutes from major ski areas. 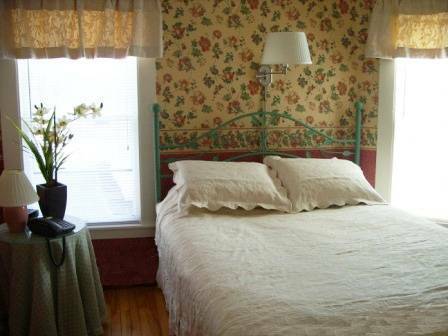 Twenty well appointed rooms with private bath, cable TV and free WIFI. Some suites with kitchenettes and whirlpool. Some of our rooms are even dog friendly! Our rates include full country breakfast cooked-to-order with at least a choice between 8 entrees. Children menu available. 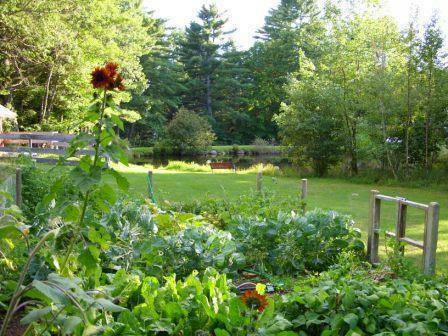 2010 Environmental Champion Member of the New Hampshire Sustainable Restaurant and Lodging Association. Whether Spring, Summer or Fall, the clear bracing mountain air will recharge your spirits and will allow you to fully enjoy our grounds with its magnificent pine trees, wooded trails, mountain stream and a picturesque nature pond. In this storybook setting you can enjoy our beautiful seasonal forty-foot pool, and our year round Jacuzzi Hot Spa. For those seeking a change of pace, we provide basketball and volleyball courts, as well as trout fishing in our pond. In Winter, we are ideally located 1 mile from Cranmore Ski Resort, with its 11 lifts and tubing, and offer discounted lift and tubing tickets as well as ski packages. You can also x-country and snowshoe for FREE when you stay with us! The main building offers 13 rooms and suites, with choice between double, queen, king size beds. We offer family rooms with more than 2 beds in the room. The Loft building offers 7 rooms and suites with private bath as well, some with jacuzzi tub. We have two 2-bedroom suites and 2 suites with kitchenette. Some of them are dog friendly. All our rooms have a private bath, cable TV and FREE WIFI. A full cooked-to-order breakfast is included in our rates and served each morning between 7:30 and 9:00 am. All our rooms come with FULL country breakfast cooked-to-order each morning! 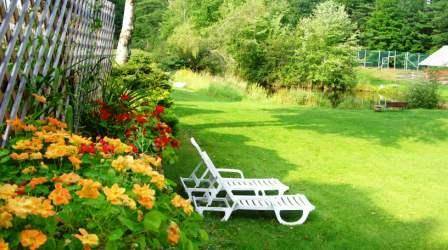 We are located in a residential area, on 8 acres of peaceful land, just 1. 5 miles from North Conway Village and 1 mile from Cranmore Ski Resort. A brook is running along our property and hiking trails, good for snowshoeing, x-country skiing or biking as well, start right from our backyard. 10 minutes from us, authentic Italian dishes prepared by and Italian Chef! 5 minutes from us, the best Irish pub in the area! 10 mn from us. Our favorite seafood restaurant. *Rates are based on 2 or 4 people occupancy, depending of the rooms (even a small child counts as 1 person). Add $20 + tax for each additional person in the room (including children). *Rates include a full country breakfast cooked to order each morning, between 7:30 and 9:00 am. *All rates are subject to the 9% New Hampshire rooms and meals tax. *All rates are subjects to change and are based on availability. *Rates do not include gratuities. Because we are a small property and not a chain hotel, any cancellation affects us greatly : whether it to be for reason of sickness, family or medical emergency, death in the family or weather, we strictly enforce our cancellation policy. *Reservations are confirmed by email (unless you request it by mail) upon receipt of an advanced deposit made with a valid credit card (Mastercard, Visa, Discover): One full day rate is required for a one night reservation, 50% deposit is required for two or more nights, 100% deposit is required if reservation is made within 7 days of arrival. *Deposits are applied to the last day of your reservation, which means that early checkouts forfeit their deposits and are responsible for ALL nights booked. *Full payment is required at check-in. If you check-in after 8 pm, we will charge your credit card for the remaining balance on the day after your arrival. 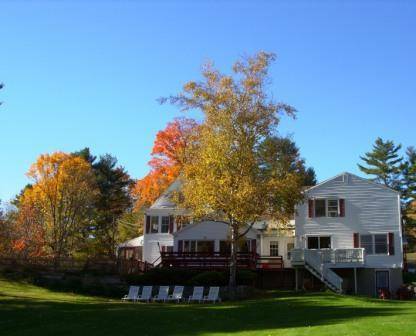 *There is a $25 surcharge per room on all cancellations to cover paperwork ($30 per room during fall foliage season). *A fourteen day cancellation notice is required to receive a full refund minus the cancellation fee. Reservations cancelled less than 2 weeks before arrival - but more than 7 days - will be refunded only if we are able to rent to another guest over the entire reserved period. If the room remains un-rented, we gladly issue a credit voucher in the value of your deposit (minus $25 cancellation fee), valid for 4 months. *Reservations cancelled within 7 days before arrival or in case of no-show, whatever the reason is, will be charged in FULL and ARE NOT REFUNDABLE. No credit voucher will be issued. Please check with your travel agent or your credit card provider about different types of travel insurance if you have cancellations concerns. When you reach North Conway: turn right on Kearsarge Road - this is the traffic light with Horsefeathers Restaurant on the right and a large park and train station on the left. Drive up Kearsarge Road, past the Cranmore Inn, until you reach a "T" intersection at the top of the hill. Turn left and drive straight to Cranmore Mountain Lodge, located 1. 2 miles from the "T" intersection. Cranmore Mountain Lodge is on the right side of the road. The street address is 859 Kearsarge Road. From Routes 16/302, turn left onto Hurricane Mountain Road (by the Vista Country Store). Go up the hill one mile to Kearsarge Road. Turn right onto Kearsarge Road. The cranmore Mountain Lodge is located 1/8 mile down the road on the left. Concord Coach Line provide bus transportation coming from Boston, Portland, New York City and other towns. The terminal in North Conway is just 5 minutes from us.